Making Progress at a turtles pace. 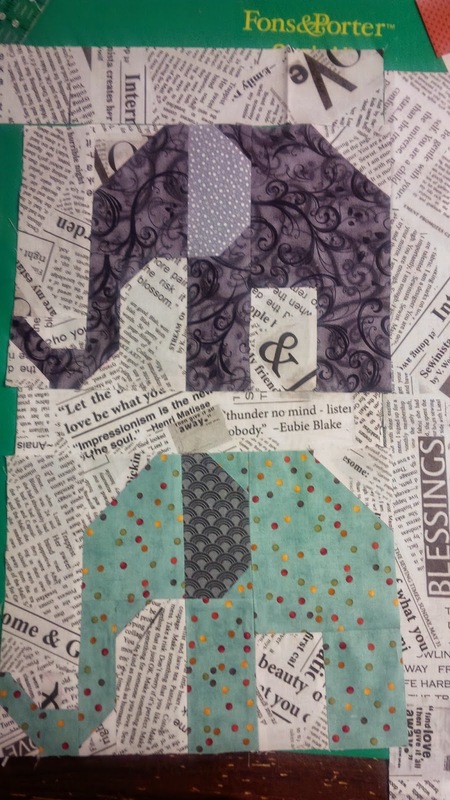 I have finished the frog and turtle blocks for the Elephants on Parade. They are so stinkin' cute. 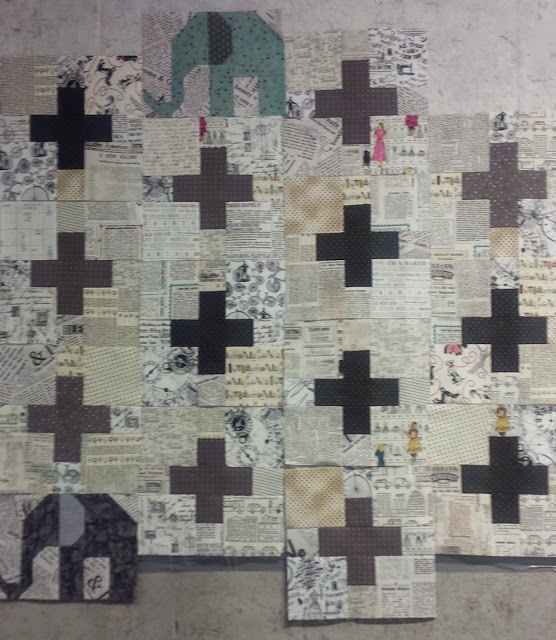 I know it is not a finished quilt but sometimes in life I feel even getting a block or two done in an accomplishment. Obviously I am a better starter than a finisher. I have finally started on my version of Lorna's Elephants on Parade. 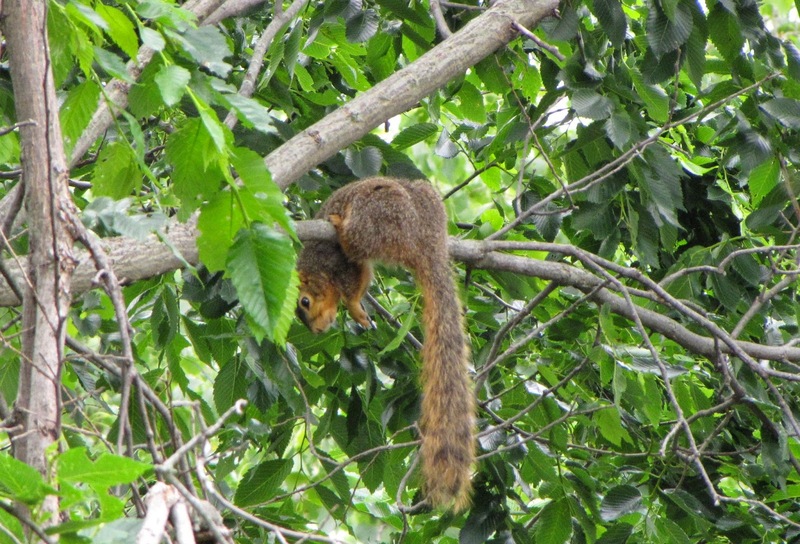 I think it is going to be just adorable. Here are the first two larger elephants. I will post more as I get them completed. This is the prettiest reminder of spring that I have come across this year. It is just outside a window in our our home office and we are able to look right down onto the nest. It will be fun to watch the progress. Not a whole lot of sewing going on right now. I have started a class on sock knitting and am really enjoying it. I have come to the conclusion however that I can just about make a quilt in the time it takes me to make a sock. and them when I have one made I have to make another one to make the first one worthwhile. I am not sure I will be a sock knitter. But at least when I am finished I will know that I could be if I wanted to be. 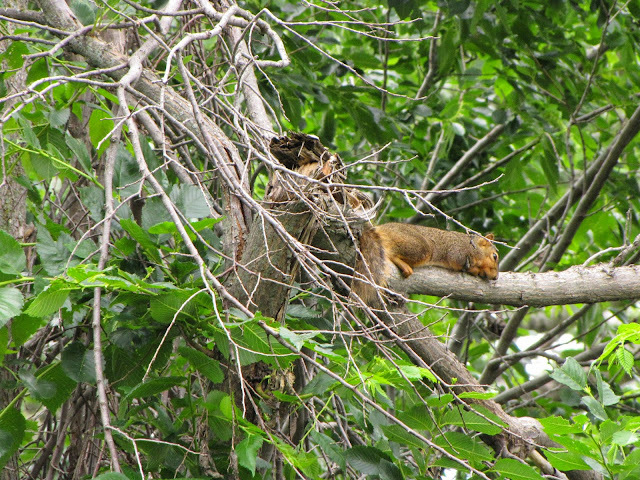 I have scratched that itch and can move forward. 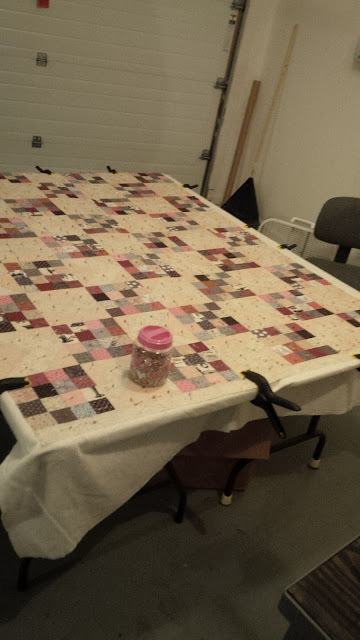 This is a picture of the quilt I have been working on. The pattern if from a tutorial by Jenny Doan from The Missouri Quilt Company. She does such lovely tutorials and I just love their website. A friend and I went to see the stores one day and it was really nice to see so much fabric in one place. It is a really small town and they have like 5 stores. 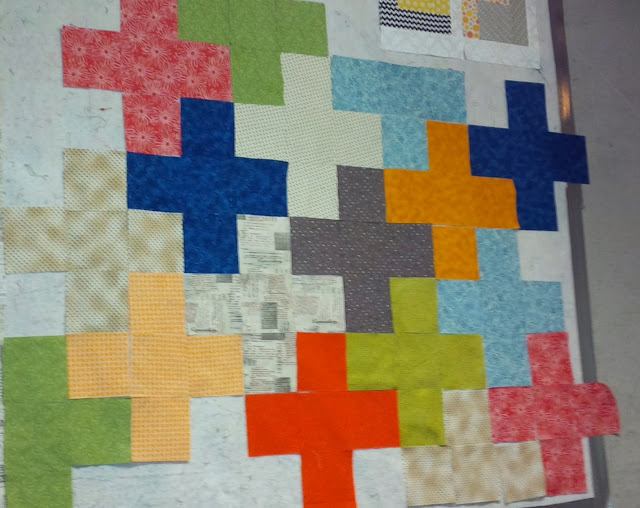 I wish I had more contrast in the background squares in my quilt but have decided it is worth finishing anyway. It does look better in person than in the pictures. I an still trying to decide on the borders. Well the guild block of the month was a huge turnout. We had 17 women submit blocks. I was really excited to see this many participants. I really hope this keeps up all year. 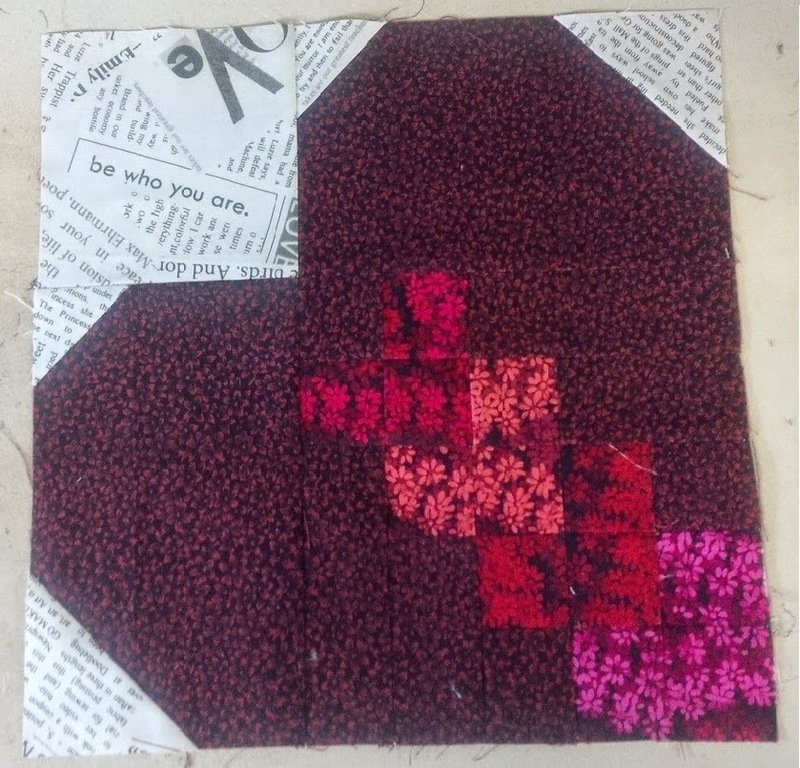 This was probably a challenging block since it was paper pieced. The February block it traditionally pieced so there may be more participants. I have made three so far. It's kind of hard to lose the blocks but it is also very exciting to see someone win such a nice set of blocks. Should make a beautiful quilt. This is the third block I made. 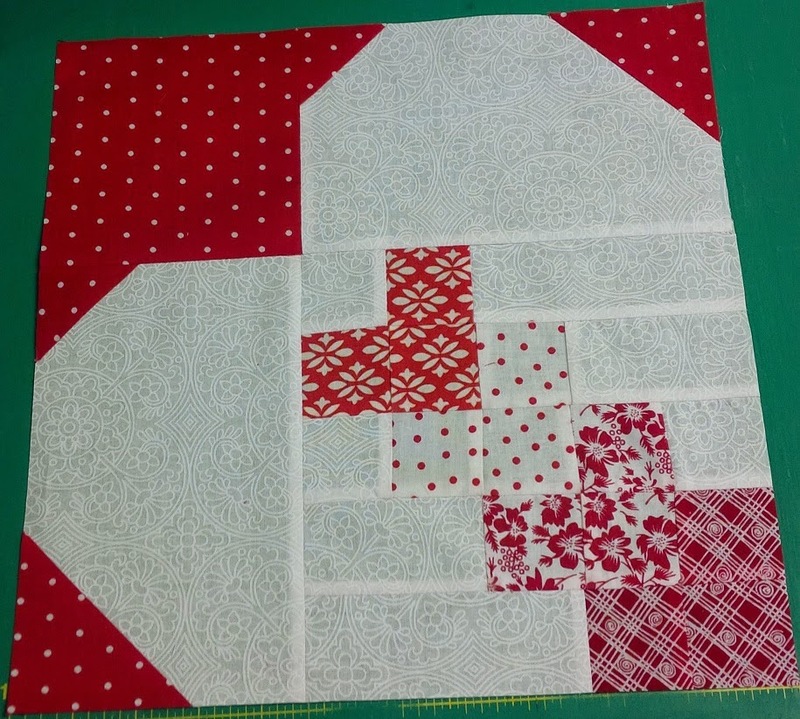 I have finished two blocks for the February guild challenge. 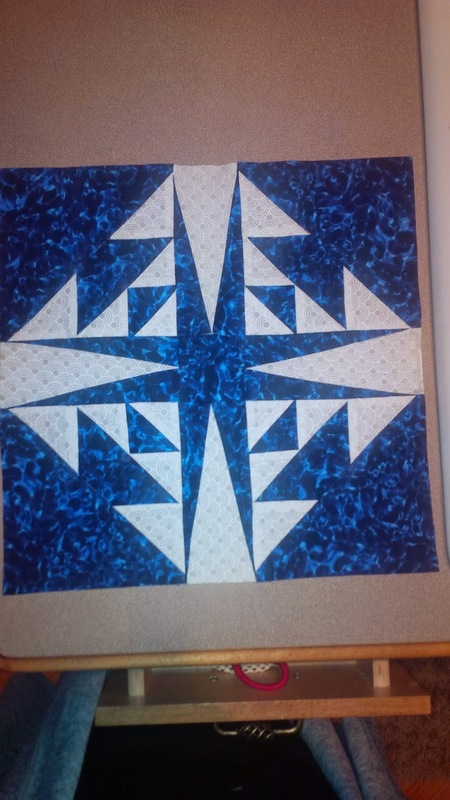 This block was a lot quicker than the paper pieced one from last month. I made two because they were easier. Well, that was one reason I made two. Actually I didn't follow the directions close enough on the first block so I made another one that was correct. I am going to submit both. The block directions asked for a white or off white background and a colored heart and I switched them around. I think it is still a cute block so going to take it. Would like to make another with light pinks before the meeting if I have time. In the past year or so I have been wrapping my fabrics on 8 1/2 x 11 inch comic book boards. They are acid free and can be purchased at a comic book store for about $10.00 per 100 boards. So far I have used over 400 boards and have wrapped many, many yards of fabric. 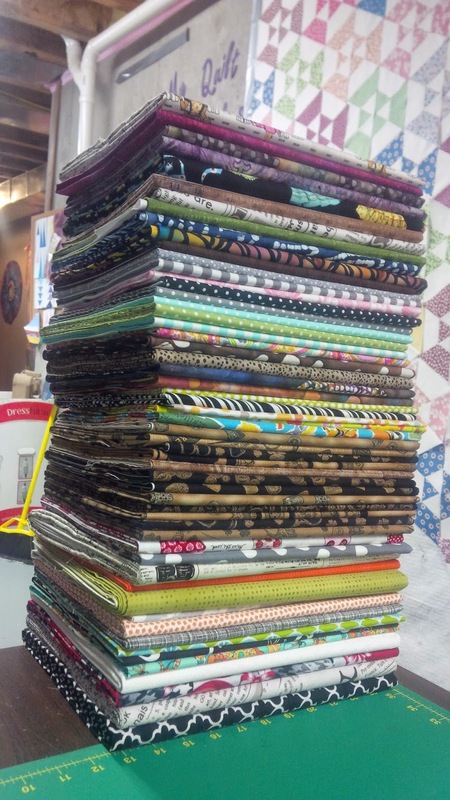 This stack is the latest bunch that I wrapped, It really helps to keep things organized. I love the way they look all nice and neat in a book shelf. I will take a picture of the bookshelf and add it when I get time. Now I just need more bookshelves or less fabric. Not much finished this year so far. 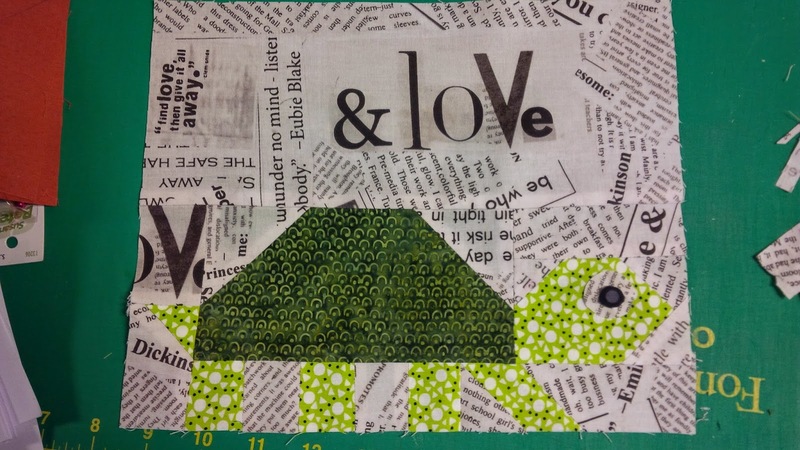 Our local quilt guild is having a block of the month program that is a little different. 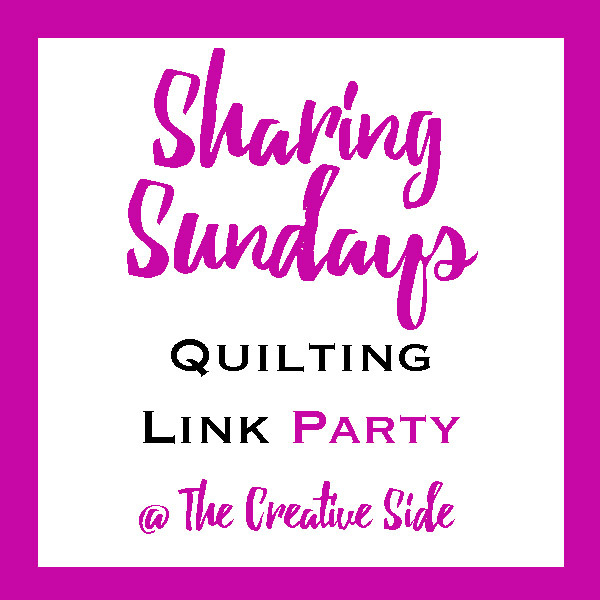 The person in charge chooses a pattern and a color scheme and anyone that wants to participate can make a block. Everyone that brings a block to the meeting gets their name put into a drawing and if their name is drawn they will all the blocks that were made for that month. The number of blocks will vary depending on how many people decide it it worth the time to make a block that they will most likely not get to bring back home. Some will decide its just not worth the trouble but I hope enough people join in to make it fun. This is the block I made. It is a Pineapple Star. 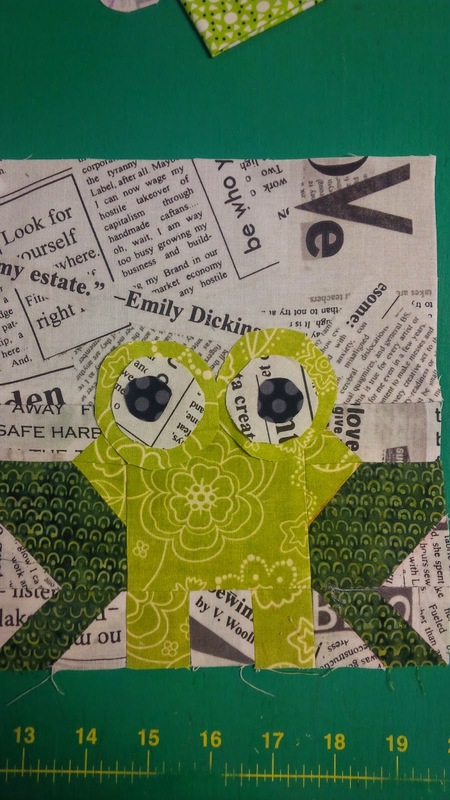 The pattern came from the Quilters Cache website. 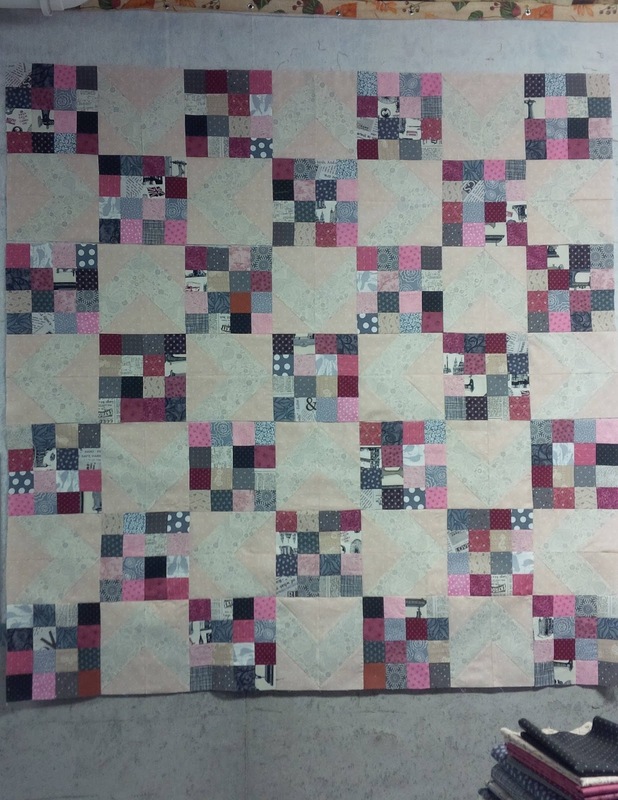 It is paper pieced and finishes at 12 inches.